Aerial view of Moscow-City (Moscow International Business Center) over Moskva River. 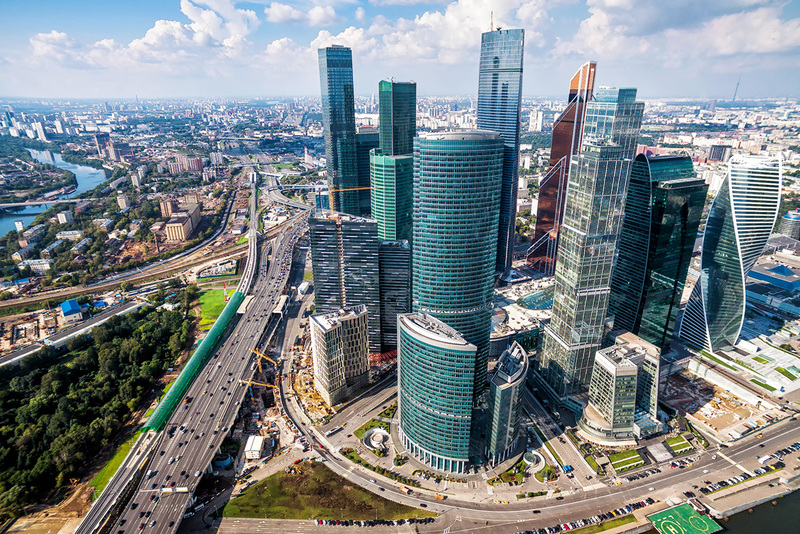 Moscow-City is a modern commercial district in central Moscow. There’s no better way to get a sense of Russia’s scale than seeing it from a bird’s-eye view. Here are the country's highest buildings, guaranteed to take your breath away. The television and radio tower was built in 1967 and is regarded as a masterpiece of Soviet engineering. It was the tallest building in the world until 1975, when the CN Tower in Canada surpassed it by 13 meters. Ostankino was designed by Soviet engineer Nikolay Nikitin whose famous works also include Lomonosov Moscow State University, Luzhniki Stadium, and The Motherland Calls monument in Volgograd. Today the tower is open to the public and anyone can enjoy panoramic views over the capital from a special observation deck. The Federation Tower is the tallest skyscraper in Russia - and Europe. It’s located in Moscow’s International Business Center (MIBC). Designed by German-Russian engineer Sergei Tchoban and German professor and engineer Peter Schweger, the skyscraper consists of two towers joined together by a central pillar rising towards the heavens. The eastern tower is taller and the project was only completed this year costing about $1.2 billion dollars. Apart from apartments and offices, the building also has restaurants, bars, tourist agencies, and even a wellness center. Finished in 2015, the OKO (South Tower) is the second tallest building in Russia and Europe. Also composed of two towers and located in the MIBC, the OKO was designed by Skidmore, Owings and Merril, an American architectural, urban planning, and engineering firm best-known for designing the tallest building in the world – Burj Khalifa in Dubai. The OKO is an apartment building with a restaurant and parking area. An apartment will reportedly set you back up to $23,700 per square meter. The blazing copper-orange façade of the Mercury City Tower makes it highly recognizable among other Moscow skyscrapers. Designed by Russian and American architects, Mikhail Posokhin and Frank Williams, the building was opened in 2013. Like its neighboring skyscrapers, it’s a multipurpose building catering to the needs of busy businessmen flying high in Moscow City. Built from 1956 to 1962, the steel lattice television tower in St. Petersburg is considered the first TV tower in the Soviet Union. At the time of its construction, the tower was the tallest structure in Europe surpassing the Eiffel Tower. Today, however, it no longer holds this feat but remains the highest building in Russia’s northern gem. Although unfortunately, it’s not open to the public, unlike Ostankino. The symbol of the Russian city of Vladivostok – the Russky Bridge – was built in 2012 to serve the Asia-Pacific Economic Cooperation Summit. Since then, it’s been successfully connecting mainland Russia with Russky Island, which has since become a regular venue for the annual Eastern Economic Forum. As the tallest bridge in the world after the Millau Viaduct in France, it cost a cool $1 billion, or there abouts. You’re not allowed to climb the bridge of course, although this hasn’t stopped Russian adrenaline junkies from having a go. A 72 storey building with offices, shops, and fitness center, the Eurasia Tower in Moscow was built by American company Swanke Hayden Connell Architects. In June it made the headlines when a Russian “roofer” tried to climb it. Unfortunately, the brave “spiderman” failed to reach the summit of the building: He was detained near the 52nd floor and immediately arrested by the police. Up until the end of 19th century the tallest building in Moscow was the Ivan the Great Bell Tower located in the Kremlin. It was built over three centuries starting in 1329 and its maximum height reached 81 m in 1600. It was forbidden to erect any building in the city taller than the tower until the Cathedral of Christ the Savior came along in 1883. Can you believe less than 50 years ago Moscow was a village?